Image credit: Lorianne DiSabato on Flickr. As summer in the northern hemisphere takes its final breaths, we’re all trying to cling to those sun-kissed moments and never-ending days that are filled with family, food and fun. AntiquityNOW wants to help you hold on a bit longer to these waning days so this week we’re bringing you a refreshing watermelon and feta salad recipe. Perfect for barbecues, pool parties or lazy days at home, watermelon is truly the taste of summer and feta is the perfect companion to the sweet, ruby red fruit. And while you’re enjoying the unexpectedly delicious pairing, you can learn about the ancient history behind this quintessential summertime melon. The watermelon has been more than just a juicy treat for thousands of years. Native to South Africa, the fruit was prized by the indigenous peoples of the Kalahari Desert not only as a nutritious food, but also as an important source of water. The flesh and seeds were especially valuable for their oils and protein content. Evidence of the watermelon’s place in ancient Egypt is found in 5,000 year old hieroglyphics depicting a watermelon harvest and in leaves and seeds found in Egyptian tombs. It was believed the watermelon remnants left in the tombs would nourish the departed in the afterlife. 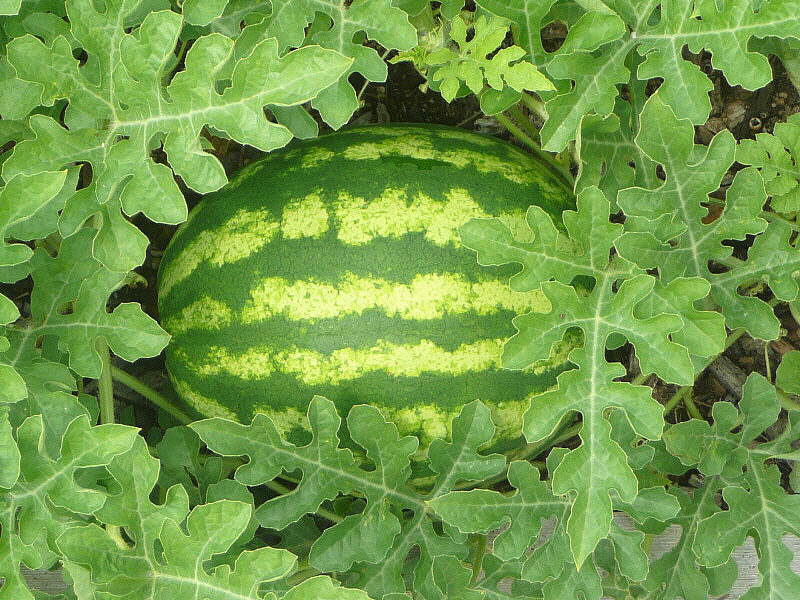 The watermelon’s reputation as a paragon of sustenance is further strengthened by its mention in the Bible where it is said to have been eaten by the Israelite slaves in Egypt. From Africa, the fruit spread to India and the Mediterranean by the 9th and 10th centuries CE and finally to China by the 11th century CE. Moorish conquerors helped to export it to Spain and then throughout Europe, but it took some time for the crop to catch on because generally the summers were not hot enough in those areas to accomplish a good yield. When the watermelon made its way to the New World via the slave ships arriving from Africa, it was embraced and cultivated by the colonists and by Native Americans. From the 16th through the 19th centuries several Native American tribes used the fruit alongside hunting and gathering because it was one of very few crops that would grow in a low-rainfall environment. Today, watermelons are cultivated all over the world. China produces more watermelons than any other country. The United States and Mexico grow between 200-300 different varieties. Regardless of where the watermelon originates, it continues to nourish, hydrate and delight in the midst of the hottest summer day, just as it has been doing for more than 5,000 years. Chop or ball the watermelon into bite-sized pieces. Whisk together the vinegar, oil, salt and chopped mint. Add salt to taste. 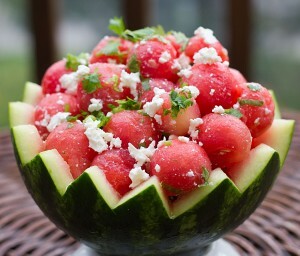 Combine the watermelon, feta cheese and onion. The Cambridge World History of Food- Cucumbers, Melons, and Watermelons. (n.d.). Retrieved August 21, 2014.
 http://www.fns.usda.gov/sites/default/files/watermelon.pdf. Retrieved August 21, 2014. The Cambridge World History of Food. National Watermelon Promotion Board | Kids | Watermelon Facts. (n.d.). Retrieved August 21, 2014. This entry was posted in Blog, Bon Appetit Wednesday, Culinary, Culture and tagged Ancient Africa, ancient history, ancient recipes, AntiquityNOW, Bon Appetit Wednesday, Kalahari Desert, melon, summertime, watermelon, watermelon and feta salad. Bookmark the permalink.